Cabins are dwellings that tend to be smaller in size with one or one and a half stories. Most cabin plans are characterized by an overall cozy feeling that make them perfect for vacation retreats. These homes used to house agricultural workers and their families, thus they were a smaller peasant style housing option. In North America, they now most used for weekend or summer getaways by city dwellers. This style of home works generally well when located near lakes, streams, and in wilderness conditions such as mountains where there are winter sports, exceptional fishing, and hiking. 306 Sq. Ft., Width 22'-6", Depth 21'-0"
456 Sq. Ft., Width 25'-0", Depth 25'-0"
416 Sq. Ft., Width 26'-0", Depth 22'-0"
720 Sq. Ft., Width 24'-0", Depth 30'-0"
676 Sq. Ft., Width 26'-0", Depth 32'-0"
480 Sq. Ft., Width 32'-0", Depth 22'-0"
984 Sq. 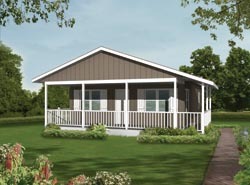 Ft., Width 28'-0", Depth 26'-0"
Hous ePlans and More's collection of cabin plans includes many great styles and smaller sizes perfect for that special dwelling whether for everyday living or a vacation getaway. We offer detailed floor plans that allow buyers to visualize the look of the finished home. With a wide variety of plans, we are sure that you will find the perfect do-it-yourself project to fit your needs and style.